This is no quotidian* day. It’s been marked in our mental calendar for over a year. 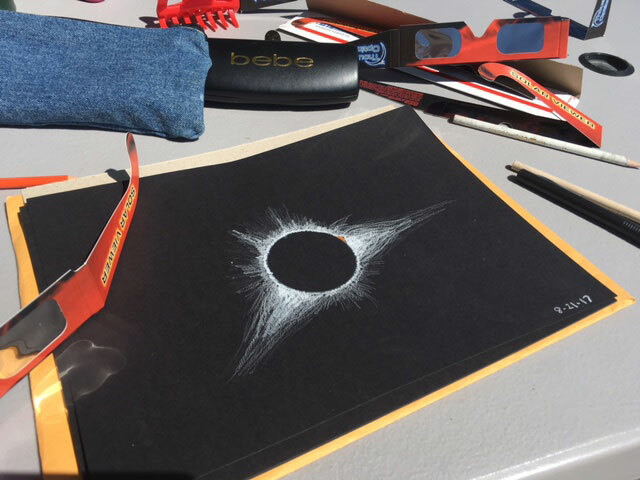 After all, how often does a total solar eclipse occur on your 18th wedding anniversary? 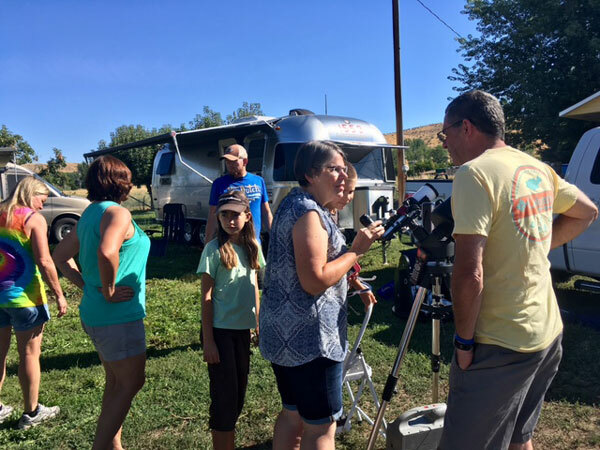 For this momentous occasion we have positioned ourselves within the path of totality by boondocking at a lovely Harvest Host location in Weiser, ID. Surrounded by fruit trees, family and some serious astronomical sun chasers, we are in good company. A solar telescope is set up. Eclipse glasses are within reach. Pinhole viewers are being crafted. Plastic lawn chairs face east. Excitement is building. The solar super bowl is about to commence and the spectators are fully unified. With upturned faces and protected eyes, we witness the moon silently slip between celestial bodies signaling the start of the show. From this “first bite” moment the following come in quick succession. A chiaroscuro* of strange, overlapping, solar crescent shadows expand the experience from sky to earth. Chickens begin to head toward their hen house. Shadow bands dance across the white plastic picnic table. “Two minutes until totality!” Someone announces. Excitement steps up a notch. How black will it get? Will the darkness pour over us like a storm or appear suddenly like a light switch? We notice that Quinten is not among us and start calling his name. Nothing. Where could he be? Totality is nearly here, he can’t miss it! Ashlyn finds Quinten inside our RV hunting for his flashlight in case it gets dark enough to warrant it. They rejoin us just in time for the grand finale. No words can describe the beauty I witness as deep shadows envelop the earth, plunging our mid-summer day into an erie cool. We have reached totality and it is safe to remove our glasses and face this moment unobstructed. The sapphire sky is suddenly swept away by indigo darkness and the once penetrating light is perfectly obscured behind the moon’s circular silhouette. All that remains around the perimeter are silvery, white-hot wisps silently dancing through the cosmos, reaching outward, grasping at the open expanse. It is a mesmerizing moment that demands attention, begs to be remembered. The moments are fleeting, yet I have a keen sense of awe and humility wash over me. This is not a place where pride can dwell. Only a holy reverence remains. A sense of passing grandeur overtakes me and I morn that it will soon be over. My mind struggles to retain the depth of detail, to ensconce the endangered memory deep within, where it can remain untouched and pure. The splendor is suddenly pierced with a diamond of brilliant sunlight peeking out from behind the veil of darkness. Just like that, the magic is broken. With our solar glasses readjusted, we watch as the moon begins to slip slowly back into obscurity. Its fun to watch but I’ve been ruined by the totality. Nothing compares. How about you? 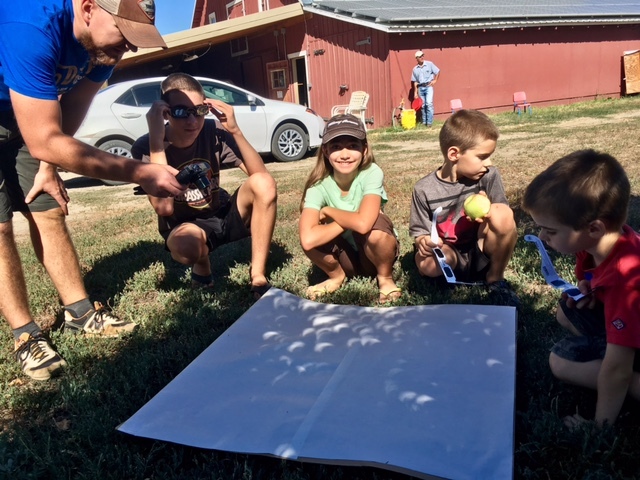 Were you in the path of totality? 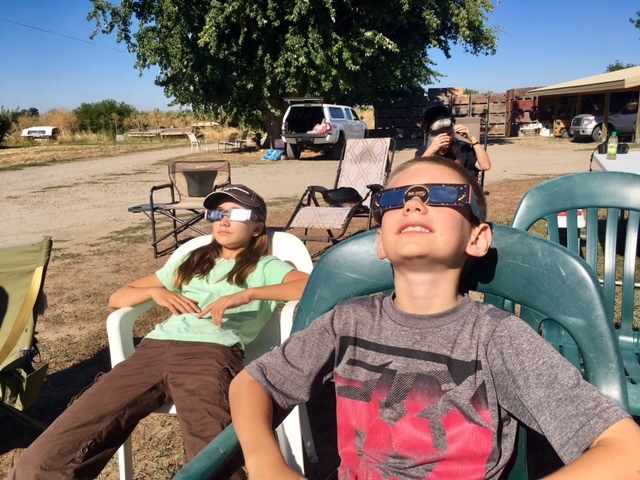 What was your solar eclipse experience? Quotidian: |kwōˈtidēən|adjective: ordinary or everyday, especially when mundane: This is no quotidian day. Chiaroscuro: |kyärəˈsk(y)o͝orō| noun: an effect of contrasted light and shadow created by light falling unevenly or from a particular direction on something: A chiaroscuro of strange shadows expand the experience from sky to earth. So glad your family got to share that experience! Isn’t God amazing! We were able to see the eclipse in totality in Carbondale, IL, my hometown! It was beautiful! Interestingly, in 7 years Carbondale will again be in the path of totality on April 8, 2024, when an eclipse crosses our nation southwest to northeast. That’s fantastic! Wow, two times in a row, cool! Maybe we will have to look for a Harvest Host in Carbondale for the next one😊! Firstly, happy anniversary! It’s always exciting to hear of couples making it work and you two are doing just that. Prays for another amazingly, wonderful 18 years (and then some). How fun for the kids to experience this. We didn’t have total coverage here but it was still a fun time and the kids loved it. Looking forward to experiencing another eclipse or anything of coolness in the sky (is that even a thing lol). 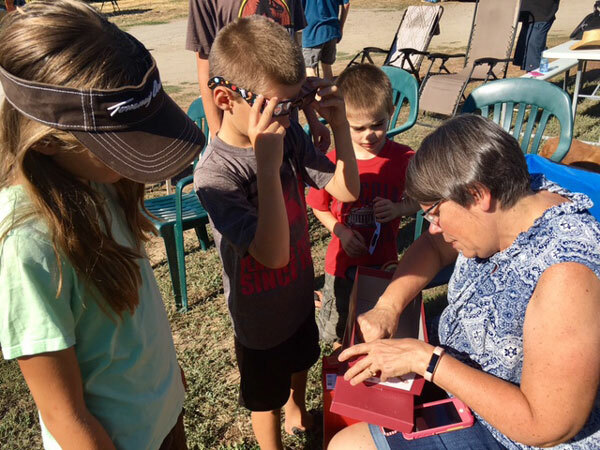 Thank you and I am with you on wanting to experience another eclipse in the future! Maybe your next one will be in Mexico or something wild like that! Wow! I’ve heard lots of accounts of the eclipse but this was the most beautifully written! I was bummed that we weren’t able to see it. Thanks for recreating it for us. Thank you Melinda. When I sat down to write I had no idea how I was going to possibly describe the indescribable. It was a challenge. I am glad it helped you envision the moment. Agreed! It was truly awe inspiring! Yes, I am really thankful to have experienced it in person!